Continuing the series of “tablet brands you never heard of” for the 2012 winter season. Here is a comparison of Android 4.0 tablets by Coby. 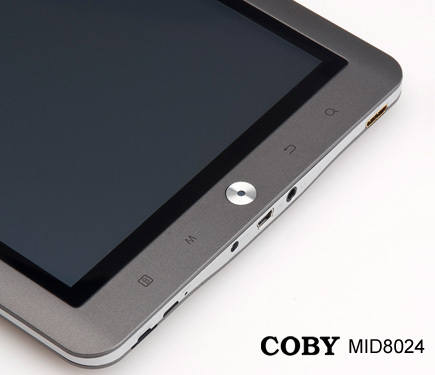 You might have actually heard of Coby before, as they have been around for quite a few years in consumer electronics. In fact, I use to sell their products in retail stores. While I don’t endorse any particular model of cheap tablets, you can count on these to run the same hardware as the rest (most are all assembled in the same plant). It will come down to what features you want or maybe what’s included (such as headphones or a leather case). Solid Tip: Watch out for the older models of Coby tablets floating around. They might be cheaper, but have older 2.3 versions of Android. See a list of the older Android versions at the bottom. Coby has called their line of Android tablets “Kyros.” The Kyros™ line has a model numbering scheme of MIDxxxx, which contains a 4 digit number to denote the model. The first two digits are for size in inches – 7.0, 8.0, 9.0, 9.7, and 10. Older models have a 2nd digit of 1. These are Android version 2.3. The final two digits identify the specific model. The higher the number, the better. The following table compares screen size, CPU, RAM, storage, display, camera, and HDMI output. Also included are images and model numbers to help you identify the ones you are considering. Solid Tip: A note on the Cortex™ CPUs – the Cortex A5 is a newer, more efficient CPU, compared to the Cortex A8, which was a larger chip, more expensive, and less efficient. Yes the lower number is the better chip. Then there is the ARM11 chip, which is the predecessor to the A8, making it the oldest CPU design. Do Coby tablets have Flash player? First, download Flash apk file on your computer. Click here to download. Now connect your device to computer and transfer that file to your tablet. Go to Settings->Apps. Check Unknown Sources box. Use a File Manager app such as ES File Manager to locate the Flash apk file. When done install, your tablet has Flash. Go to websites like youtube.com to test the videos to make sure that it worked. Coby started out in 1991 and is arguably a brand that may no longer be on the “brands you’ve never heard of” list. In the early 1990’s, COBY’s business was mostly audio components and accessories. Then, with the advent of digital media and portable devices, it branched out to portable CE products and then into TVs and home theater. Coby was named the #1 selling digital photo frame brand in the US (in units) for calendar year 2008, according to market research firm NPD. For more info on the brand and their other product lines, check out their website at http://www.cobyusa.com. Older, slower, and less capable. Avoid these if possible and choose a newer model up above.